Nestled in Otter Tail County, Minnesota, the city of Rothsay is a peaceful and safe community that is both tranquil and historic; the small town atmosphere pervades in this city of less than 600. With top rated schools and an involved community, Rothsay real estate will give you a city you will proudly call home. Close to I-94, Rothsay is just 15 minutes from Fergus Falls, 45 minutes from Fargo, ND, and three hours from Minneapolis and the attractions of the big cities. Single family homes in one and two story design are prevalent. Large lots and peaceful surroundings distinguish homes in Rothsay. Natural woodwork is often a feature of these attractive homes; large spacious homes with eat-in kitchens and formal dining rooms can easily be found. Affordable and beautiful, homes in Rothsay are perfect for all sizes of families. Farmhouse styles that date back to the early 1900s make living in a historic property a reality here. Your children will attend schools in the Rothsay School District. Honored by US News and World Report, two years in a row, the Rothsay Secondary School has been named one of the best High Schools in the nation. Opportunities to learn music and art along with computers and athletics distinguishes the fine Rothsay schools. Within Rothsay, retail sales, production and laborers are the most popular jobs. Building and grounds maintenance, equipment repair and drivers are also found here. Fosse Transport, Rothsay Telephone and many other businesses can be found locally. Rothsay is where the Bobcat was developed and is also known as the Prairie Chicken Capital of Minnesota. 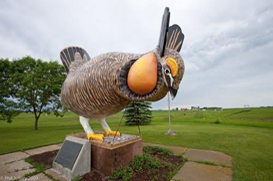 As the capital, it boasts the largest prairie chicken in the world at 13 feet high, 18 feet long and 9,000 pounds! Rothsay’s Pioneer Prairie Park provides baseball fields, picnic areas, hiking trails, a footbridge, and a natural habitat. Sledding, snowmobiling, cross country skiing and more happen here in the winter. Enjoy American Legion Memorial Park; a merry-go-round, swings and playground await. Take a walk to Ole and Lena’s Pizzeria, quite simply the best Norwegian pizza you will ever eat! Rothsay real estate brings it all home.